There were four Martin Swindells in succeeding generations. We differentiate them by adding I, II, III or IV. Likewise, there were two Francis Swindells, marked I and II. Not all of them are covered in these histories. His father was a farmer living at Disley Hall (precise whereabouts not known). Francis is said to have run away from home when he was 16 in 1779 owing to the severity with which his father had treated him. After some exciting adventures he reached London and took service as a groom to a gentlemen. On one occasion as he was taking his master’s family by night in a coach over Hounslow Heath [London Heathrow airport today], he was attacked by a highwayman. By that time he had risen to be coachman, but he was riding as a Post-Boy, because at that time the coachman did sit on the box, nor drive as done now . But regardless of the threats of the robbers and of the fact that they fired at him, he rode furious on and brought the family safely within the gates of his master’s grounds. He married one of the servants of the house, of the name of Litton, and having saved money, returned to his native country. He and his brother came into Stockport together to settle there and it was said of them that they were the two finest looking men who had ever come to Stockport. There he began life again as a cotton manufacturer and went on successfully for some time. Family tree. In 1830 he moved from Manchester to live at Pott Hall, Pott Shrigley (he rented it), in order to run his new Clarence mill at Bollington. He owned or rented most mills in Bollington at various times, employing over 2,000 people. After having converted to Methodism at the age of 18, Martin was instrumental in the building of the Methodist church in Bollington, and, later, the Kerridge Wesleyan chapel; he also paid for refreshments at the opening of St John’s Church in 1834. He was a Proprietor of the Macclesfield Canal Co. Clarence mill was totally dependent on the canal for transport of raw material in and finished product out so being close to the canal management would have been very important to him. He was a subscriber to the London & Birmingham Railway Co. No doubt he recognised the coming importance of railways, despite being dependent on the Macclesfield canal, and would want to use his influence where he could for the benefit of his business. The railway didn’t reach Bollington until 25 years after his death. He built Limefield House behind Clarence Mill. He left this to his daughter Anne and her husband Joseph Brooke. 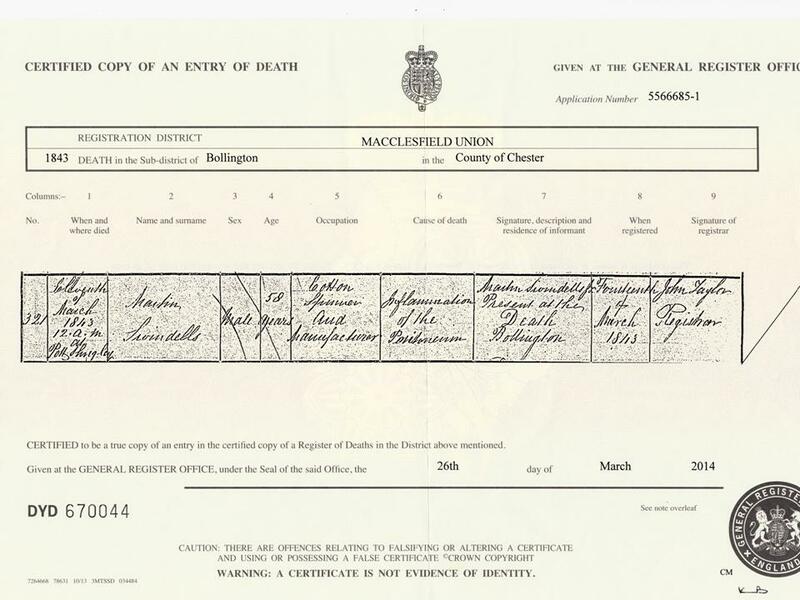 He built Rock Bank House for himself and Hannah but died before he was able to occupy it (death certificate ). “When quite young he was sent to his grandparents at Macclesfield and remained with them until he was 13 or 14 years old. Martin was very fond of music, and one day a regiment of soldiers passed through the town with a brass band, he followed them all the way to Stockport and enlisted as a Drummer boy. But he was found by his parents and was bought off or got off somehow. He then went to live with them and helped his father in the cotton mill.” There is much more about Martin’s early years in the notes left by Emma Brooke. Martin & Hannah had six children. Hannah (nee Shepley) predeceased Martin in 1839. Martin then married Eleanor Robinson. Martin Swindells died at Pott Hall 11 March 1843. Family tree. After the death of his father, Martin Swindells I, in 1843, Martin II, together with Joseph Brooke, carried on the business as partners. But they gave up all the mills except Clarence (this was before Martin and brother George built Adelphi). 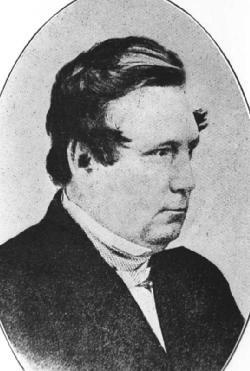 Martin converted to Methodism in 1851. The family were generous subscribers to the Wesleyan Church. On 18 July 1855 Martin lost a leg in a serious accident at the mill when material or mechanism being lifted slipped and fell on him. He built Adelphi mill with his brother George, opening it in 1856. Adelphi is Greek for ‘two brothers’. Martin married Frances Brooke in 1834. They had three children: Martin, (born 1836), Frederick and Hanna (both born in 1845 – twins? ), while living at Ingersley Clough. Frances died in 1846 at the young age of 33. Martin then married his servant Charlotte Rowley (by then living at Rock Bank House) and they had six children: Charlotte (born 1850), Bertha (born 1853), Walter (born 1855), Janet (born 1856), Ethel (born 1860) and Edna. Martin retired on 13th January 1869 and left the mills; his son Frederick took over. In 1872 he and his second wife Charlotte moved to Cambridge. In Bollington they had lived at Rock Bank House, adjacent to Clarence mill, and this was sold to Fred Wilkinson, who was a director of the company, Brooke, Swindells & Co. Martin died at Cambridge in 1880 aged 66. Charlotte went on to the grand age of 85, dying in 1909. Family tree. Frederick was the son of Martin Swindells II, and born in 1845. He became the company secretary of Brooke & Swindells & Co. with an office at Clarence before taking over the management of Clarence and Adelphi mills on the retirement of his father, Martin II, in 1869. In the same year he married a lady by the name of Emma Davies but this was disapproved of by his father. He lived at Rock Cottage, Kerridge, but by 1886 he and Emma were living at Rose Cottage, Endon, Kerridge. They had four children. Family tree. In 1871 his salary was £120pa, in 1872 it was raised to £200pa, and by 1878 he was paid £298.2s.7d. George was another son of Martin Swindells I, brother of Martin II, and born in 1820. He studied Law at the Inner Temple until his father’s death in 1843 then returned to Bollington and the mill. He built Adelphi mill with his brother, Martin II, completed in 1856. George was a Director of the Macclesfield, Bollington & Marple Railway Company, which built the railway in the late 1860s, opening in 1869. He succeeded to Pott Hall after the death of his father. He married Elizabeth Cawley and they had one child, George Cawley Swindells, before her death from pneumonia when she was just 45. 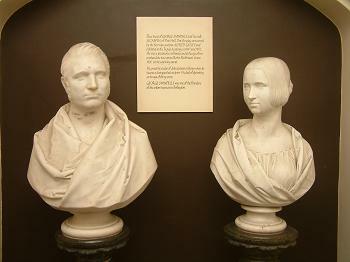 The pictures of George and his wife Elizabeth are of busts by Alfred Gatley, the Kerridge sculptor. George’s niece, Emma Frances Brooke, made notes of a conversation with George in April 1885 from which much of our knowledge about the family is drawn. Family tree. Son of George Swindells, born 1854. Little is known about his career. He married Eleanor Maud Hillier. He and Maudie, as she was known, both converted to Catholicism which caused a considerable rift in the family which on Maud’s father, Charles’, side was strong Anglican and on her mother Eliza’s side, evangelical, dissenting. They had four children, one son being Geoffrey Hillier Swindells who went into the mill. Family tree. 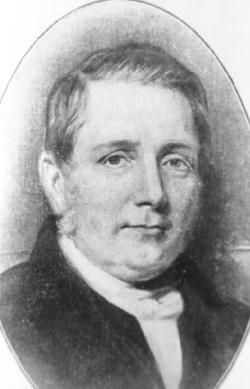 Son of George Cawley Swindells, Geoffrey became manager of Adelphi mill. He went into the army during WWI and became Colonel of the 4th Battalion Cheshire Regiment. He died in action in France on 1st August 1918 aged 44. Family tree. Extract from A Century of the Wesleyan Methodist Church of Bollington, W.H. Lake (1908), p.48. Extract from the same, p.54. From Emma Brooke’s notes. See page devoted to this.